Thanks for the detailed info on the Photo blade1! Pleased to have wakened some memories,hopefully happy ones! of Medway Ports Limited. The enclosed docks at Chatham. Nice photo brings back memories. Just next to 'south lock inner' are the two tugs i used to operate back in 1995.They are the 'Lashette' and 'Shovette'. berth no3 shows 'spirit of independance' this was in for repair at A&P. The flat area to the top right is where Kent Line used to have it trailer park,they moved out a couple of years before this photo. There's still quite a bit to uncover about this area. Particularly the post-1939 period through to final closure of HMS Wildfire. From the aerial photo one can see several establishments that were on or very close to the CinC's residence. If we use the junction of Mill Road and Medway Road as the centre of a clockface we can try to identify some of them. The info I am using comes from an OS map overprinted with Admiralty specific details. 12.00 - CiC's tennis courts. 1.00 - The RN Gas School, RM Police quarters, RN Victualling Depot. 6.00 - The RN Wireless School Made a mistake! It was the RN Signal School. 10.00 - The RN Artificers School (HMS Fisgard) Relocated in early part of WW2. What I can't work out is exactly where RAF Gillingham was, although it may have been co-located with another establishment with the RAF echelon going by the name of RAF Gillingham. The Admirals Gardens, House and Tennis Courts. It was visted both by King George V and Churchill who did an overnighter there. It was were much of the ship movement in WW2 in the Channel was controled from i understand including the Normandy landings. Though you wouldn't know it, in Heritage terms far to valualble to be so low profile. Training school was later with Wildfire reserve unit took over. Historic aerial photos - don't you just love them! When you look hard at this one there is so much to see. 1. Look over to the Upnor side of the river and you can see how extensive the ammunition jetties were at the Lower Upnor Depot with the railway line from Lodge Hill going right out along the jetty. 2. You can see the old Arethusa just above the ammo jetties. 3. Being mainly chalk overlaid with thin topsoil, any excavations are hard to hide. Find the US Sports Stadium at the bottom of the picture. The Napoleonic ditch to the west looks as though it has just been filled with chalk rubble. Just south of the stadium the new army quarters at Sally Port Gardens and Kings Bastion are being built so the chalk removed for the quarters may have been dumped into the ditch? 4. Just north of the stadium you can see the old hut accommodation for the Royal Engineer Pay and Records Office on the site of what became the NAAFI Club, now King Charles Hotel. 5. Down on Medway Road another large area of chalk spoil can be seen almost on the site of the Nore Command, later Wildfire, bunker. That also looks like exposed chalk in the ditches just north of the command bunker where another little known of bunker was built. 6. The old Medway Road Camp is quite clearly shown just north of Black Lion Fields. It looks to be quite extensive with building stretching right across from Medway Road to Mill Road. At one time this was the Chatham RN Wireless School, although others recall being here at another time with the RAF. itary purposes, or in the case of those over into Gillingham for shelters? With so many areas like that showing it would be great to get someone experienced in aerial photograph interpretation to have a look at it. Pity the photo doesn't show anything further south as it would be interesting to see what was happening in Kitchener Barracks, Fort Amherst and on the Lines! In the observatory building in Chatham maritime there was a massive german WW2 aerial photo of Medway in the main reception - guess it was about double A0 size, whatever that is! Not sure if it was the same as the one posted above, but its been a while since I've been in there. Anyone else seen it? My Daugher worked for Colonial in the building also, she said they were brilliant employers. Then when they ceased she got a job in local Government. I working in the orange building on the bottom left corner of the picture up until abuot 4 years ago. Looks like it is still under construction in this picture. Colonial House it was called. 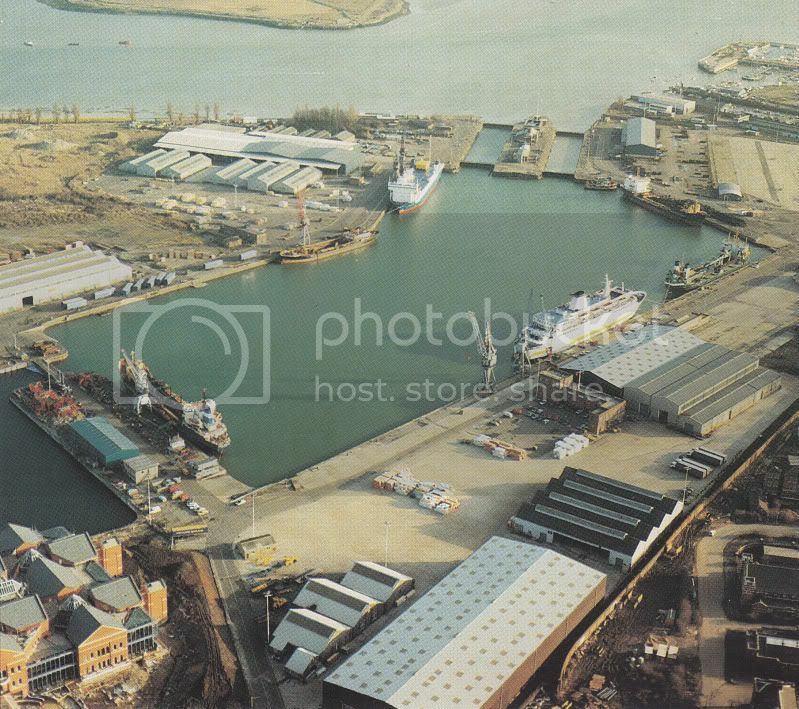 The photo brings back memories of bleak winter nights back in the early 2000s when I worked on the security team at that part of the docks, and yes, it is the Gillingham gate entrance. And beieve me, wandering around those docks in the middle of the night in the middle of winter is not enjoyable....!